Issue: Although predictions that the Affordable Care Act (ACA) would lead to reductions in employer-sponsored health coverage have not been realized, some of the law’s critics maintain the ACA is nevertheless driving higher premium and deductible costs for businesses and their workers. Goal: To compare cost growth in employer-sponsored health insurance before and after 2010, when the ACA was enacted, and to compare changes in these costs relative to changes in workers’ incomes. Methods: The authors analyzed federal Medical Expenditure Panel Survey data to compare cost trends over the 10-year period from 2006 to 2015. 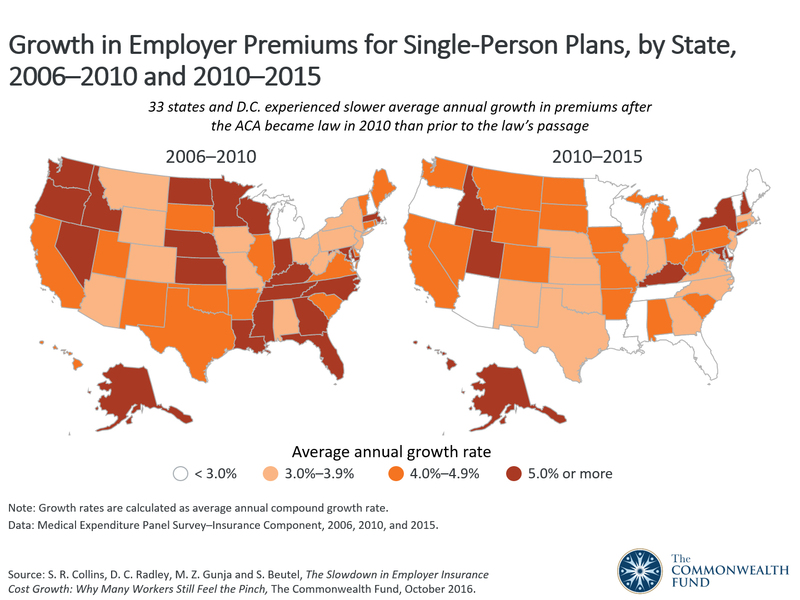 Key findings and conclusions: Compared to the five years leading up to the ACA, premium growth for single health insurance policies offered by employers slowed both in the nation overall and in 33 states and the District of Columbia. There has been a similar slowdown in growth in the amounts employees contribute to health plan costs. Yet many families feel pinched by their health care costs: despite a recent surge, income growth has not kept pace in many areas of the U.S. 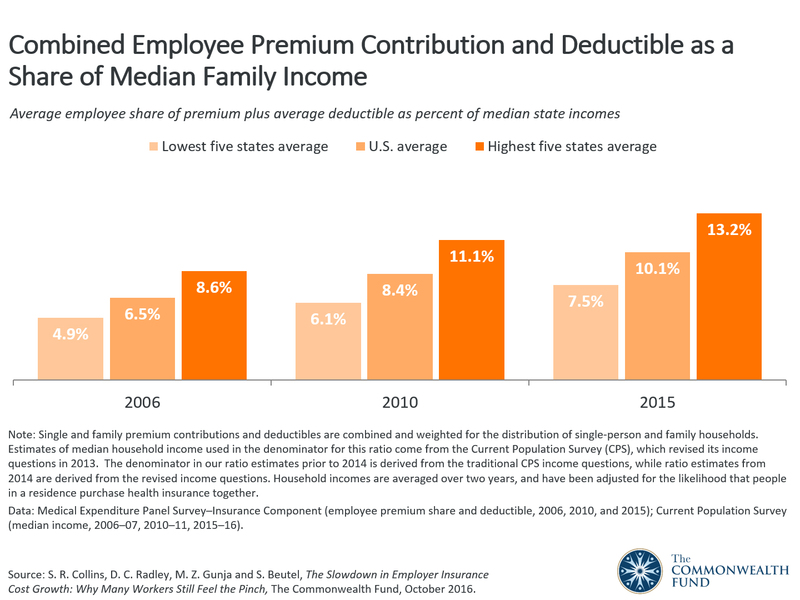 Employee contributions to premiums and deductibles amounted to 10.1 percent of U.S. median income in 2015, compared to 6.5 percent in 2006. These costs are higher relative to income in many southeastern and southern states, where incomes are below the national average. Contrary to early predictions that many employers would stop offering health insurance in response to the ACA’s new coverage options, there has in fact been little change in the share of the nonelderly population covered by employer plans since the law went into effect in 2010. Annual premium growth rates for employer-sponsored health plans have slowed on average since 2010, the year the Affordable Care Act was enacted. 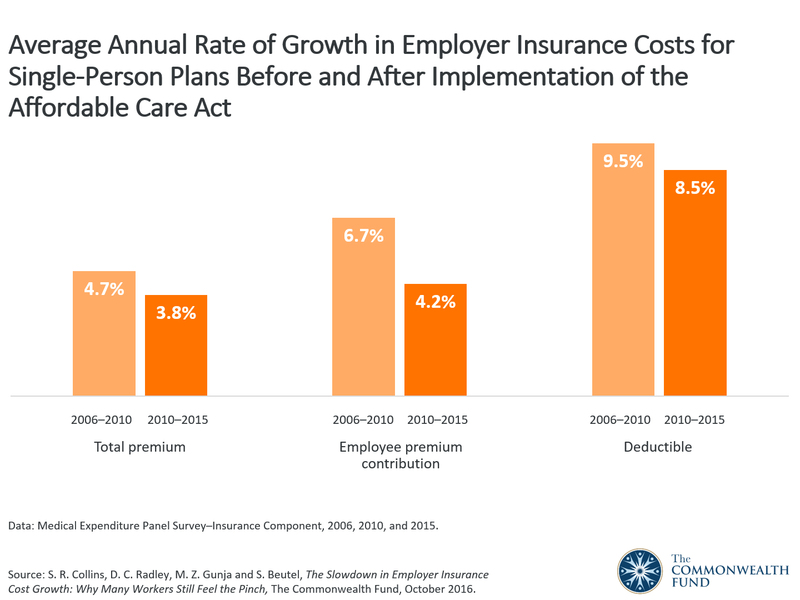 For single-person plans, or those that cover only the employee and not any family members, average premium growth rates slowed to 3.8 percent per year from 2010 to 2015 compared with an average 4.7 percent from 2006 to 2010 (Exhibit 1, Table 1a). At the state level, 33 states and the District of Columbia experienced slower premium increases for single policies since 2010 compared to earlier years (Exhibit 2, Table 1a). Louisiana experienced the largest slowdown: average annual premium growth ticked down from 7.8 percent per year from 2006 to 2010 to 2.4 percent from 2010 to 2015. Nine other states (Florida, Maine, Minnesota, Mississippi, Nebraska, Nevada, Oregon, Tennessee, and Wisconsin) and the District of Columbia saw a decline in annual premium growth of at least three percentage points. Premium growth rates remained high in eight states (Alaska, Hawaii, Idaho, Kentucky, Maryland, New Hampshire, New York, and Utah). These states experienced average growth rates from 2010 to 2015 of 5 percent per year or higher. Five of these states—Alaska, Hawaii, Idaho, Kentucky, and Maryland—also had increases in the years leading up to 2010 above the national average (Table 1a). The actual size of employer premiums also ranged widely. Annual family premiums averaged $17,322 nationally in 2015, ranging from $14,218 to $15,959 in the five states with the lowest costs (Alabama, Arkansas, Hawaii, Michigan, and Tennessee) to $18,920 to $21,089 in the four highest-cost states (Alaska, Delaware, New Hampshire, and New York) and the District of Columbia. (Exhibit 3, Table 1b). Annual family premiums exceeded $18,000 in nine states and the District of Columbia. People with employer health insurance policies contributed an average of 21 percent of the total annual premium cost for a single policy, or $1,255, in 2015 (Exhibit 4, Table 2a). This percentage has not changed since 2010 but is up from 19 percent in 2006, when the average contribution was $788. In 11 states—Connecticut, Kansas, Louisiana, Maryland, Massachusetts, Minnesota, Nebraska, New Hampshire, New Jersey, South Dakota, and Tennessee—workers are paying 24 percent or more of their premiums on average, with costs ranging as high as $1,652 annually for a single plan in Connecticut. Workers pay more for family coverage, shouldering 27 percent of the cost or $4,710, nationally (Table 2b). Again, the share is the same as in 2010 but up from 25 percent in 2006, when the average contribution was $2,890. Employees contribute 30 percent or more of the total premium cost for employer plans in 16 states. Families in Maryland contribute the most—an average of $6,365—to their plans. As with the total cost of employer premiums, employees’ contributions for both single and family policies have grown more slowly since passage of the ACA compared to the prior five years. Single-premium contributions grew 4.2 percent annually from 2010 to 2015, compared with 6.7 percent from 2006 to 2010 (Exhibit 1, Table 2a). Contributions to family policies grew 4.8 percent annually in the most recent period compared to 6.5 percent in the five years before the ACA (Table 2b). After the passage of the ACA, employee premium contributions for single plans grew at a slower pace in 31 states and the District of Columbia; for family plans, contributions grew at a slower pace in 30 states and the District of Columbia (Table 2a and Table 2b). 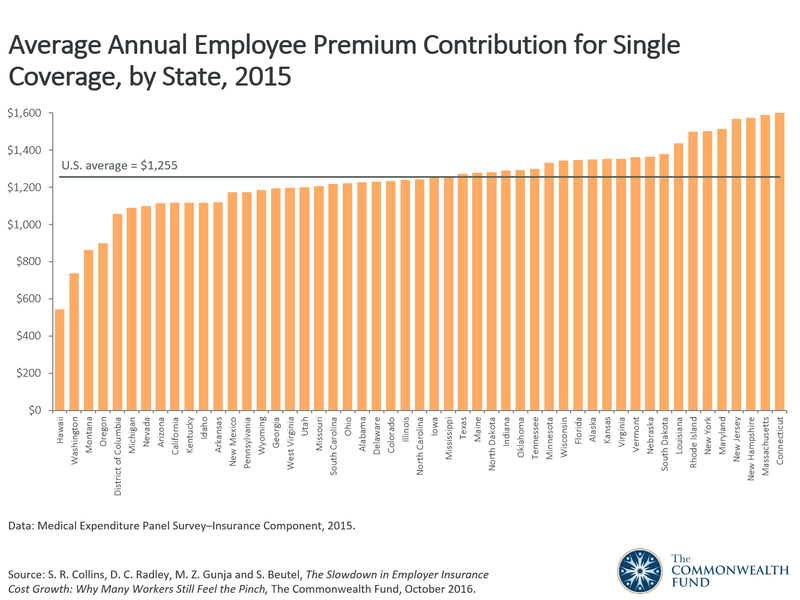 In the remaining states, growth in employee premium contributions were the same or higher for single and family plans. In New York, for instance, the pace of growth in premium contributions ticked up to 6.7 percent annually for single plans between 2010 and 2015; the rate between 2006 and 2010 was 3 percent. 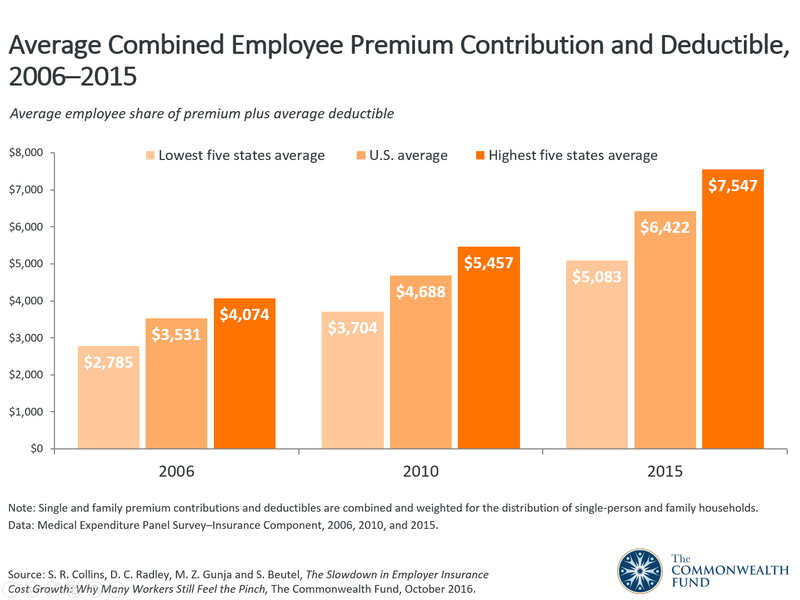 Despite this overall relative slowdown in employee premium contributions, continued slow wage growth through 2014 (albeit with a modest recovery in 2015) means people still contributed more to their premiums as a share of income than in earlier years.3 Total employee premium contributions for single and family plans accounted for 5.8 percent of median household income in 2015, compared to 4.2 percent in 2006 (Exhibit 5, Table 5).4 Total employee contributions ranged from 4.2 percent of median income in Hawaii to 9 percent of median income in Mississippi in 2015. Contributions were greater than 7 percent in seven additional states (Alabama, Arizona, Florida, Louisiana, New Mexico, Oklahoma, and Texas). On a positive note, growth in employee contributions for single policies slowed to less than 2 percent per year between 2014 and 2015 (data not shown). This means that, on average, at least in the most recent period, median income grew faster nationally than did premium costs for people with single policies. The number of employer plans requiring deductibles, as well as the size of those deductibles, has grown over the past decade. In 2015, 85 percent of single-person health plans had deductibles, compared with 66 percent in 2006 (Table 3). The spread of deductibles occurred across most states, with 95 percent or more of single-person plans having deductibles in 14 states (Alaska, Idaho, Indiana, Iowa, Kansas, Missouri, Minnesota, Montana, Nebraska, North Dakota, Oklahoma, South Carolina, South Dakota, and Washington). 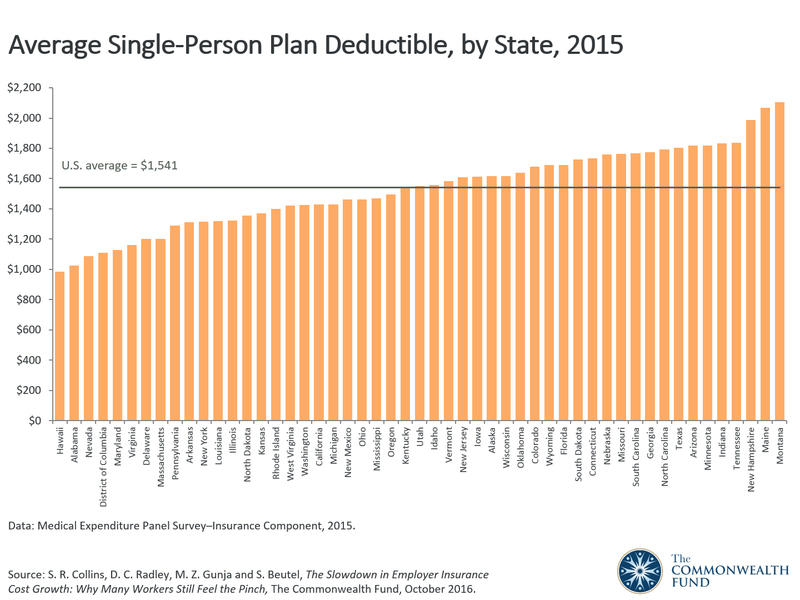 Hawaii is an exception: only 44 percent of plans included a deductible in 2015. High deductibles are the norm in employer plans. 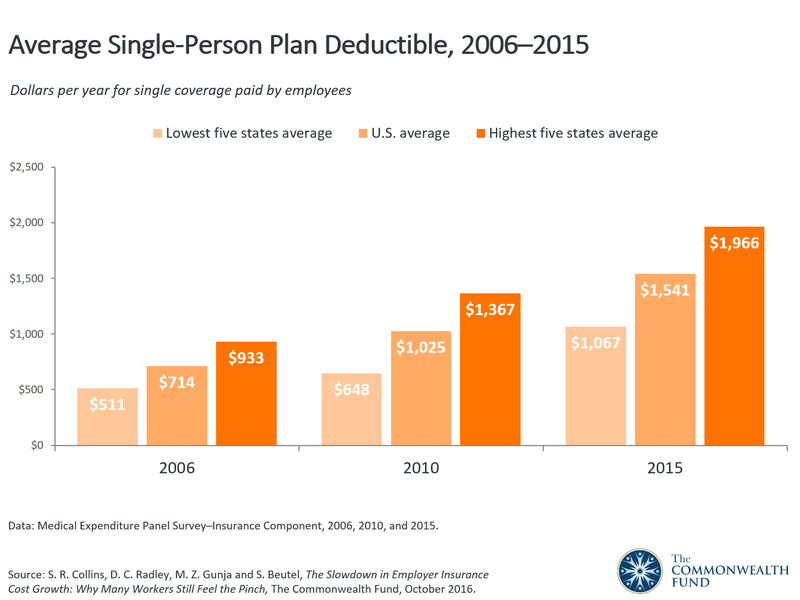 Nationally, the average single-person plan deductible was $1,541 in 2015, more than double the average of $714 in 2006 (Exhibits 6 and 7, Table 3). In 2006, there were no states where the average deductible exceeded $1,000, but by 2015 all states—with the exception of Hawaii ($986)—had average deductibles higher than $1,000. Average deductibles exceeded $2,000 in Maine and Montana. Nationally, the average annual rate of growth in deductibles has slowed since 2010, compared to the five years before the ACA, but it remains high. Deductibles in single-person plans grew 8.5 percent annually between 2010 and 2015, compared with 9.5 percent between 2006 and 2010 (Exhibit 1, Table 3). In 27 states, deductibles grew at a slower pace in the years after the ACA’s passage compared to the years leading up to it, but at a faster pace in 22 states and the District of Columbia. There was considerable variation. In Hawaii, single-person plan deductibles declined on average by 4 percent per year on average between 2006 and 2010 and then grew at an average rate of 13.7 percent from 2010 to 2015, although Hawaii has the lowest single deductible nationally. At the other end of the spectrum, deductibles in Maryland grew at an average annual rate of 17.1 percent in the years before the ACA and then climbed at a rate of 4 percent in the years following. 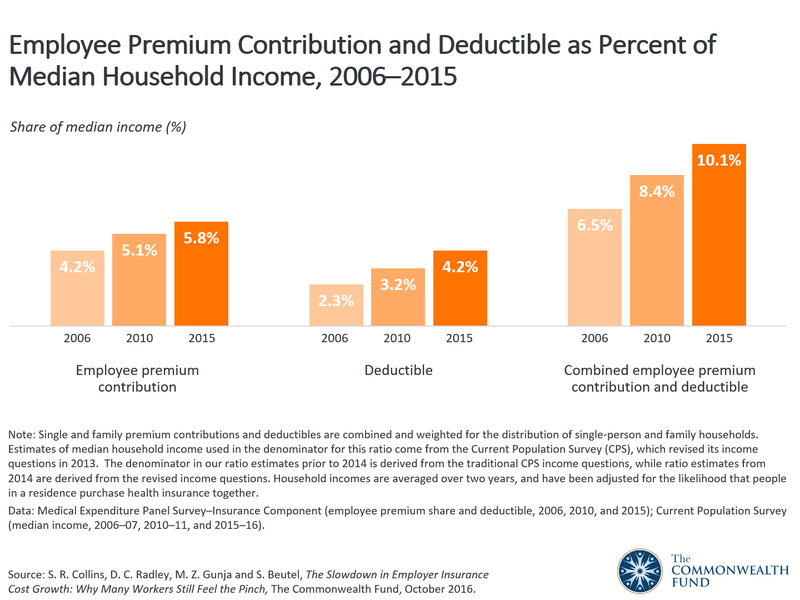 As with premium contributions, employees’ deductibles are comprising a growing share of income. Average single-person and family deductibles amounted to 4.2 percent of median household income in 2015 nationally, nearly double the amount (2.3%) in 2006 (Exhibit 5, Table 5).5 Deductibles ranged from 2.3 percent of median income in Maryland to 5.7 percent of median income in Mississippi in 2015. Average deductibles were 5 percent or more of median income in 11 additional states (Arizona, Florida, Georgia, Indiana, Maine, Montana, New Mexico, North Carolina, South Carolina, Tennessee, and Texas). When premium contributions and deductibles are combined, U.S. families with employer coverage had an average potential health care cost burden of $6,422 in 2015, up from $3,531 in 2006 (Exhibit 8, Table 4). Families with moderate incomes were at risk of spending 10.1 percent of their earnings on health insurance and health care in 2015, compared to 6.5 percent a decade earlier (Exhibit 5, Table 5). In 2015, the combined cost of premiums and deductibles as a share of income was 12 percent or higher in seven states (Arizona, Florida, Mississippi, New Mexico, Oklahoma, Tennessee, and Texas). Workers in Mississippi had the largest burden on average, at 14.7 percent of median income. Families in the District of Columbia and Massachusetts had the lowest costs as a share of income (6.8% and 7.3%, respectively) (Table 5). Over the decade, differences across states have widened, leading to increasing inequality in families’ health care cost burdens. In 2006, the difference between the share of median family income necessary to cover premium costs and deductibles in the five states with the highest burden and the five states with the lowest burden was 3.7 percentage points (8.6% vs. 4.9%) (Exhibit 9, Table 5). By 2015, that difference had widened to 5.7 percentage points (13.2% vs. 7.5%). With the exception of Arizona, the states with the highest burdens in 2015 (Florida, Mississippi, Oklahoma, and Texas) were in the Southeast or South. In contrast, the lowest-burden states (Hawaii, Maryland, Massachusetts, and Pennsylvania, along with the District of Columbia), are scattered across the country. In the following sections, we take a closer look at what may be driving these differences. Families living in states with the highest burdens tended to have both less generous health plans (Table 3) and lower incomes (Table 6). While total premiums were lower than or near the national average in each of these states (Table 1a and Table 1b), employees contributed a larger share of the premium for family and single coverage (except for single plans in Arizona) than the national average (Table 2a and Table 2b). Consequently, all but Arizona were in the top eight for the dollar amount of family premium contributions nationally.6 Oklahoma had the second-highest average family premium contribution in the nation (Table 2b). Four of the five states (Arizona, Florida, Oklahoma, and Texas) were in the top half of all states in single-person deductibles (Table 3).7 Each of these states was in the bottom half of all states in median household income. Mississippi is the lowest-income state (Table 6). For the states with the lowest burdens, the opposite was true: plans tended to be more generous and median incomes were higher. Three of the four lowest-burden states (Maryland, Massachusetts, and Pennsylvania) and the District of Columbia were in the top half of all states in median household income (Table 6). At the same time, all five states had average single-person deductibles that were below the national average (Table 3). 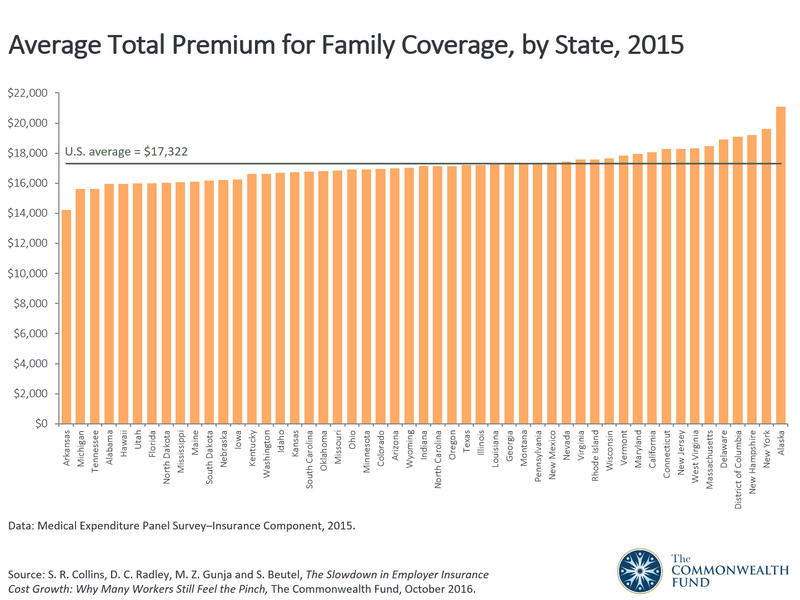 Three of the states were in the bottom half of all states in family premium contributions (Hawaii, Massachusetts, and Pennsylvania) (Table 2b).8 Maryland workers, however, contributed more than one-third (35%) of the cost of their family premiums, the highest percentage in the country. Hawaii’s low employee costs stem from its mandate, established in 1974, that requires employers to offer health care coverage. Employers of any size are required to offer coverage to anyone working at least 20 hours per week; this coverage can cost no more than 1.5 percent of a worker’s income.9 As a result, people in employer plans in Hawaii have among the lowest costs in the country relative to income. This analysis finds a sustained slowdown in premium growth rates in a majority of states since the Affordable Care Act was enacted in 2010, likely reflecting the nationwide deceleration in health care costs.10 These findings also support the conclusion that the law’s employer requirements have been absorbed relatively easily by U.S. companies, including the coverage mandate for large companies, the provision that allows young adults to stay on parents’ policies, and the requirement that plans cover preventive care without cost-sharing. But the findings also offer evidence as to why many insured Americans view their health care costs as unaffordable.11 While growth in employee premium contributions have slowed along with premiums, deductibles continue to proliferate and their annual growth rate exceeds premium growth by a wide margin. Compounding this trend, growth in median family incomes—despite a recent surge—has lagged health insurance cost growth. Middle-income families continue to see a growing share of their household budgets going to health care. Where employees have less generous health plans as well as lower median incomes, the combination is particularly toxic. People with high deductibles relative to income are far more likely to avoid getting needed care than those with more affordable out-of-pocket costs.12 For those who do get health care, large medical bills can quickly exceed assets. Continued income gains in the future will help reduce the burden placed on low- and moderate-income families. But so too would innovations in health plan design that encourage—rather than dissuade—people to get the care they need. In addition, public policy solutions, like fixing the “family coverage glitch” in the ACA, could address the problem of high consumer costs in private health plans.13 Finally, because the fundamental driver of premiums across all health insurance markets is the underlying growth rate in medical costs, ongoing systemwide efforts to slow medical spending will be critical. This issue brief analyzes state-by-state trends in private sector employer-based health insurance premiums and deductibles for the under-65 population from 2006 to 2015. The data on insurance premiums and deductibles come from the federal government’s annual surveys of employers, conducted for the insurance component of the Medical Expenditure Panel Survey (MEPS). The premiums presented represent the average total annual cost of private group health insurance premiums for employer-sponsored coverage, including both the employer and employee shares. We also examine trends in the share of premiums that employees pay and average deductibles for single-person and family plans. We compared employees’ average out-of-pocket costs for premiums and average deductibles to median income in states to illustrate the potential cost burden of each, as well as the total if the worker/family incurred these average costs. To do this, we compare premium contributions with median household incomes for the under-65 population in each state, using a weighted average of single and family premium contributions compared with single and family median household incomes. We take a similar approach for deductibles. Income data come from the U.S. Census Bureau’s Current Population Survey (CPS) of households. The CPS revised its income questions in 2013, affecting the denominator in our ratio estimates. Prior to 2014, this is derived from the traditional CPS income questions, while ratio estimates from 2014 are derived from the revised income questions. Two years of CPS data are averaged to generate reliable state-level income estimates. 1 Analysis of 2015 Current Population Survey by Sherry Glied and Ougni Chakraborty of New York University for The Commonwealth Fund. 2 U.S. Department of Health and Human Services, Centers for Medicare and Medicaid Services, "First Half of 2016 Effectuated Enrollment Snapshot" (CMS, Oct. 19, 2016). 3 Median income is calculated as a two-year average given small sample sizes in some states. See How This Study Was Conducted. 4 Single and family premium contributions are combined and weighted for the distribution of single-person and family households. 5 As with premium contributions, the average of single-person and family deductible is weighted for the distribution of single-person and family households. 6 Single premium contributions were near the national average in Florida, Mississippi, Oklahoma, and Texas. 7 Only in Texas, however, was the average deductible statistically different from the national average. 8 In dollar amounts, only Pennsylvania had family premium contributions that were statistically lower than the national average. 9 "About Prepaid Health Care" (State of Hawaii Disability Compensation Division, 2016). 10 S. R. Collins and D. Blumenthal, “New U.S. Health Care Spending Estimates Reflect ACA Coverage Expansions and Higher Drug Costs,” To the Point, The Commonwealth Fund, Dec. 4. 2015. 11 S. R. Collins, M. Z. Gunja, M. M. Doty, and S. Beutel, How High Is America’s Health Care Cost Burden? Findings from the Commonwealth Fund Health Care Affordability Tracking Survey, July–August 2015 (The Commonwealth Fund, Nov. 2015). 12 S. R. Collins, P. W. Rasmussen, S. Beutel, and M. M. Doty, The Problem of Underinsurance and How Rising Deductibles Will Make It Worse—Findings from the Commonwealth Fund Biennial Health Insurance Survey (The Commonwealth Fund, May 2015). 13 For example, presidential candidate Hillary Clinton has proposed fixing the Affordable Care Act’s “family coverage glitch.” Under current law, families with access to employer coverage are eligible for tax credits in the marketplace only if the worker’s premium contribution for single enrollee coverage exceeds the affordability threshold. Fixing the family glitch would peg unaffordable coverage in employer plans to family policies rather than single polices, which would allow families to enroll in the marketplaces with premium tax credits if their family policies are considered unaffordable. Clinton has also proposed providing refundable tax credits, up to $2,500 for an individual and $5,000 for a family, to help insured Americans pay for qualifying out-of-pocket costs that exceed 5% of their income; see http://www.commonwealthfund.org/publications/other/2016/sep/2016-candidates-health-proposals. 14 C. Schoen, J. Lippa, S. R. Collins, and D. C. Radley, State Trends in Premiums and Deductibles, 2003–2011: Eroding Protection and Rising Costs Underscore the Need for Action (The Commonwealth Fund, Dec. 2012); C. Schoen, A.-K. Fryer, S. R. Collins, and D. C. Radley, State Trends in Premiums and Deductibles, 2003–2010: The Need for Action to Address Rising Costs (The Commonwealth Fund, Nov. 2011); C. Schoen, K. Stremikis, S. K. H. How, and S. R. Collins, State Trends in Premiums and Deductibles, 2003–2009: How Building on the Affordable Care Act Will Help Stem the Tide of Rising Costs and Eroding Benefits (The Commonwealth Fund, Dec. 2010); and C. Schoen, J. L. Nicholson, and S. D. Rustgi, Paying the Price: How Health Insurance Premiums Are Eating Up Middle-Class Incomes—State Health Insurance Premium Trends and the Potential of National Reform (The Commonwealth Fund, Aug. 2009). Citation: S. R. Collins, D. C. Radley, M. Z. Gunja, and S. Beutel, The Slowdown in Employer Insurance Cost Growth: Why Many Workers Still Feel the Pinch, The Commonwealth Fund, October 2016.